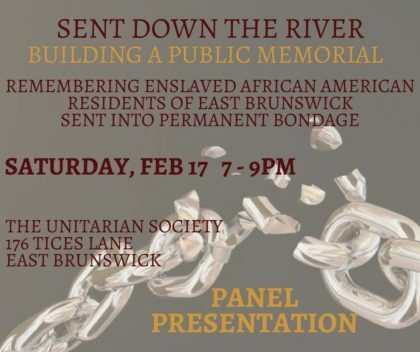 INFORM the community about the East Brunswick Van Wickle Slave Ring of 1818. INVOLVE more community members in building a public memorial. Come to his panel discussion with Q& A and community building. At this time in our nation’s history when we are rethinking our national monuments, let’s do something constructive. Let us build a memorial those people who were sent into permanent slavery by the dastardly deeds of Judge Jacob Van Wickle in 1818. Let’s make East Brunswick be the community that chooses to build memorials that go against systemic racism, like slavery and its legacy.